Let me start off by saying that I really hate bitter greens. There are only a few vegetables that I don’t like – one of them is fennel, and the other is the entire bitter greens family (endive, radicchio, frisée, God I hate frisée). Dandelion greens definitely fall into that bitter green category. If you haven’t tried them, well, they are really bitter and pretty disgusting. So why in the world did I make this dandelion greens salad, you might ask? I really don’t know. I guess it seemed like a good idea when I found the recipe. I used to eat this salad when I worked at M Cafe in Los Angeles, and though it wasn’t my absolute favorite, I still liked it and ate it frequently. This is probably the only way you could ever get me to eat dandelion greens. 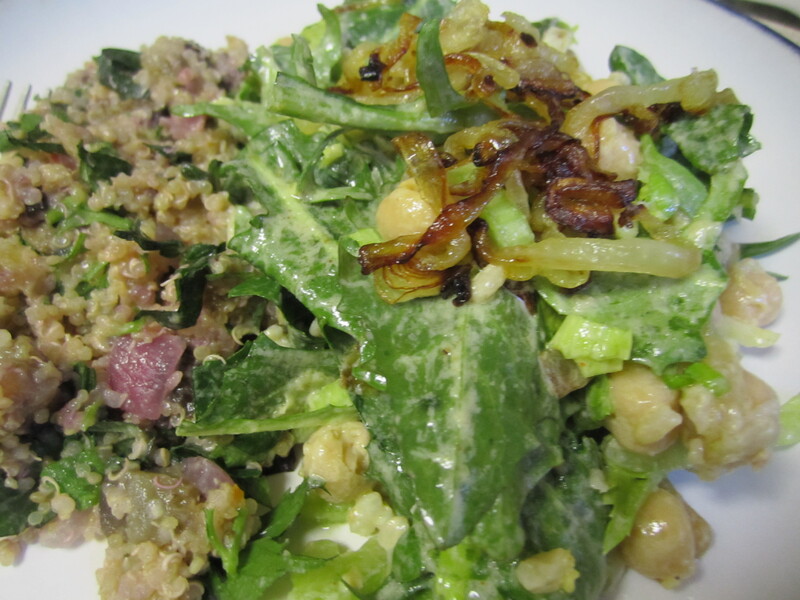 The tahini dressing is really nutty and creamy, and the sweet caramelized onions are a great compliment to the bitter greens. It really is a tasty salad, and if you like bitter greens you will like this dish a lot. Dandelion, albeit gross, is really good for you. It’s one of those cancer-fighting, antioxidant, calcium-rich superfoods. So I kind of forced myself to eat it… and truthfully I picked some of it out. I like everything in this salad but the damn dandelion. Honestly when I make it again I will probably swap it out for some Tuscan kale. So since I made this salad sound so good, I’m sure you really want to make it now :). But it’s worth a try, it’s easy and doesn’t require a lot of chopping. I served it with the Eggplant Tabbouleh I wrote about last week and it was the perfect compliment. So if I haven’t scared you away yet, copy, paste and print (someday I will figure out how to make a print button for these recipes, I promise). Combine the tahini, extra virgin olive oil, lemon juice, garlic, cumin, cayenne pepper, sea salt and black pepper in the mixing bowl. Adjust dressing with additional sea salt, black pepper or lemon juice, to taste. Heat the olive oil in a frying pan, and add the yellow onions. Fry the onions over medium heat until golden brown and “frizzled.” Transfer to absorbent toweling to drain excess oil. Season with sea salt and reserve. 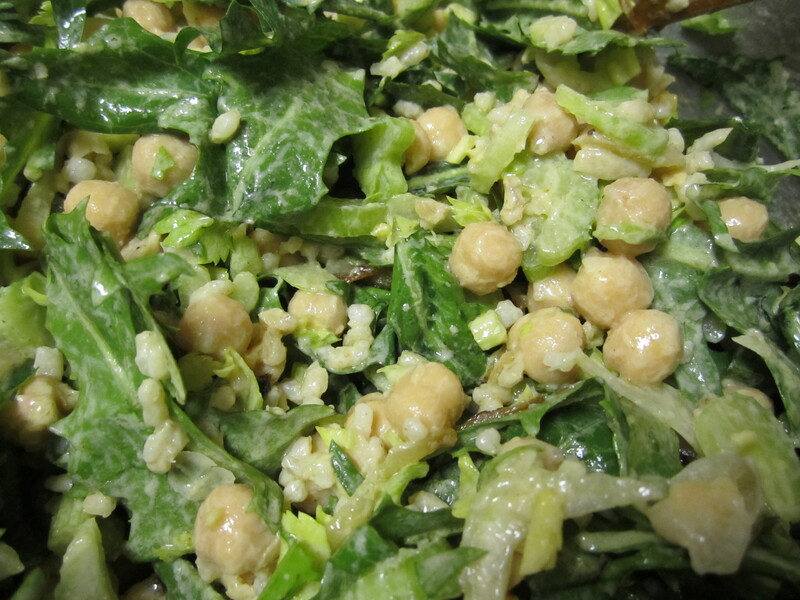 Combine the chickpeas, cooked rice, celery hearts and dandelion greens in a mixing bowl. Add 2 to 3 tablespoons of frizzled onions to bowl. 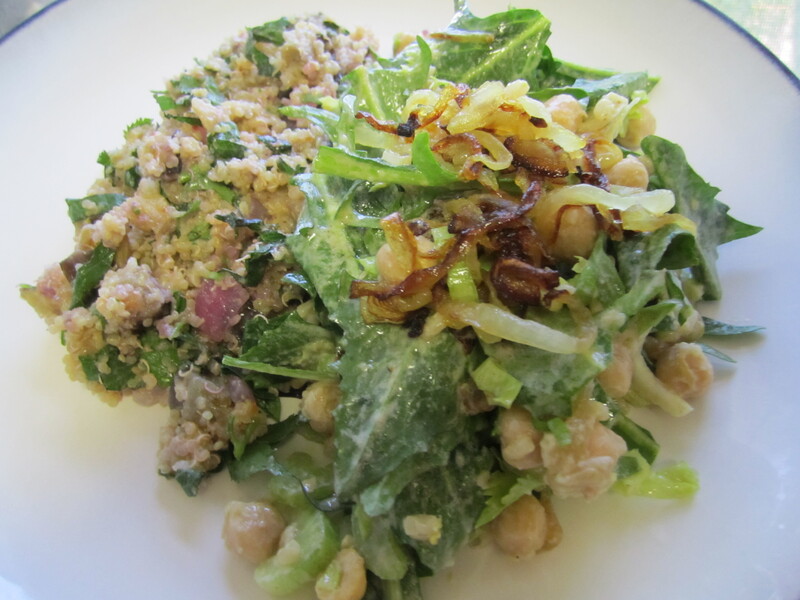 Moisten salad with about 1/2 of a cup of the Tahini-Lemon Dressing and mix well to combine. Taste salad, and adjust with additional dressing, sea salt and black pepper as needed. Transfer salad to serving bowl or platter and drizzle additional dressing, if desired. Top with additional frizzled onions to garnish. Serves 8. Pictured with Eggplant and Fresh Herb Quinoa Tabbouleh. TSI antibodies. I did the ultrasound but they only determined hyperthyroidism from that. The endo wanted to do RAI uptake but I didn’t want to do it…. it was expensive and seemed unnecessary since I wasn’t going to go through with the radiation anyway. If I understood it correctly, first you were diagnosed with hyperthyroidism and few months later the TSI antibodies were detected in your blood. Based on this you the endo diagnosed you with graves disease. Unless TSI were 5 to 10 times its limit the doctor should ask to repeat the test in 2 months because some other conditions cause such antibodies to be present. In addition, he should rule out the inflammation (thyroiditis) or possible hot nodules. (in later case the TSH is going to be in 0.05 to 0.2. The ultrasound will show patchy blood flow during thyroidits and increased uniform blood flow in case of graves combined with enlargement of BOTH lobes! Hi Shauna… checking in to see how things are going. I decided to take a different route… but still working on things. Hope you are well! Are you still doing this diet? Has it helped? And how long have you been doing it? Do you have more energy? I am still low energy and it has been 3 months. My TSH is super high, which scares me and I still have allot of fatigue. Thanks for the update….post your numbers when you get them. My TSH is super high which is why my dr says I am SO fatigued and wants me to TRY compounded thyroid med.